This is your monthly reminder to update your net worth, and then bask in all your glory from all those years of hustling!! Remember when you didn’t know a lick about finance or even what “net worth” was? Someone on last month’s update asked me why I always feel bad for publishing these as I should be PROUD of my net worth, which I am, so I’m taking ’em up on it today and reminding myself just how far we’ve come over the 10+ years despite feeling icky at times sharing these around. It’s never to brag or boast how well we’re doing, of course, but to motivate others to track it too and hold themselves accountable! It’s been such a game changer for our finances since stumbling across this community!! With that said, here’s how the month of September went down for us… Nothing *too* juicy going on, but we did cross the $900k milestone which was kinda cool. Just one more Big One to go! CASH SAVINGS (+$9,505.41): Up and up! But don’t be fooled – half of it came from shutting down our Spavings Fund last month, may it rest in peace 😉 Though we didn’t do too horrible saving more than spending this month either, which was nice. SPAVINGS FUND! (N/A): This will be the last time this shows up on these reports, but wanted to give it one more shout out as the $4,040.50 it got us was well worth the pursuit this year. Huge thanks to The Lady In The Black for inspiring this challenge over 10 months ago, as it really opened my eyes to just how much “savings” we come across on the daily! BROKERAGE (+$134.88): Nothing fancy here, just the markets doing their thing as we haven’t added anything new to it lately. It’s basically our “catch all” account for any extra money we come across outside of our “sleep happily” number in our savings 😉 As many of you know, I’m a firm believer that not every dollar needs to be optimized all the time, so that’s why we’re cool with keeping so much stashed that isn’t earning much interest… This brokerage account is our attempt to balance it all a bit better! ROTH IRAs ($497.86): Same story here – nothing new added, and it’ll be that way for a while so we don’t make the same mistake we did last year and illegally contribute to our Roths! SEP IRA ($1,425.51): Similar case here as well – been left alone for a while now as we only contribute once a year in a nice chunk to max it all out once we know what we’re able to contribute (SEP rules are based on business profits). 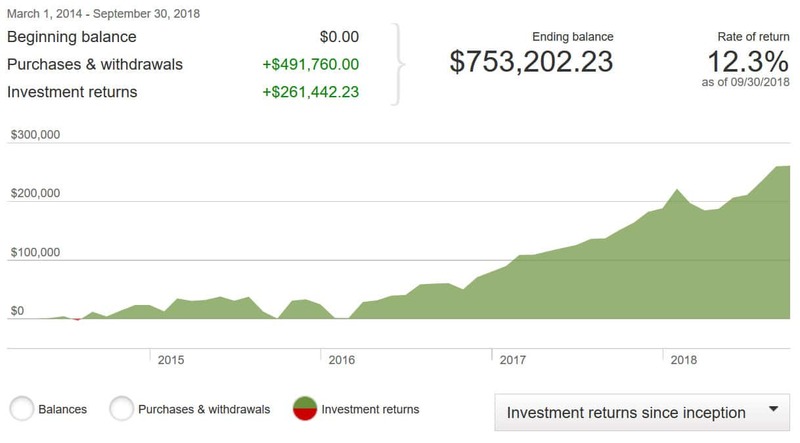 Here’s a fun screenshot though of how our investments have fared since switching over to indexing four years ago – it hasn’t sucked! Inching closer to that milly milestone! Only 10 years in the making so far, haha… Don’t think this $hit happens over night 😉 I’ve got way more gray hairs and kids than I ever envisioned starting out on this journey! 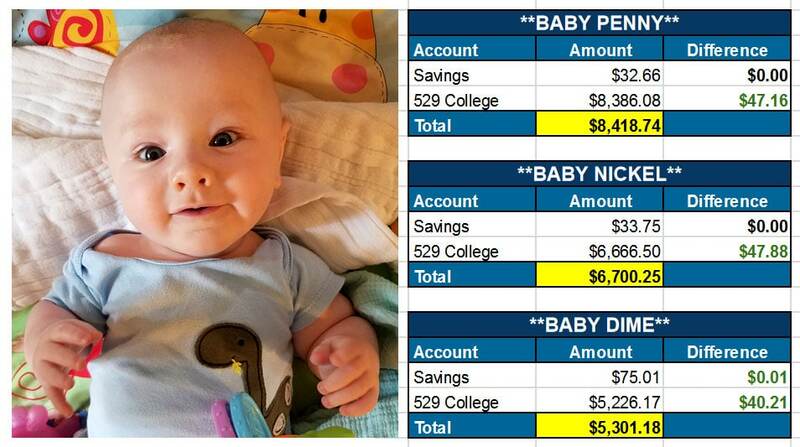 Speaking of, here are their net worths too – mashed up with a pic of my youngest babe who recently turned 4 mos old (look at those squishy cheeks!!!). Always a great reminder of why we care about money as we do – so we can LIVE OUR LIVES more! Because surprise surprise, the money ain’t about the money at all. And then here’s how the past 12 months have gone, which also shows that this stuff doesn’t happen over night… That jump there in the beginning is due to selling off Rockstar Finance – which I’m still 100% happy about, although I do miss the community! How did you do??? Anything new or juicy to report? How far have you come since you first started paying attention to this stuff? I’ll be right there too trying to keep the perspective going… As you saw in our Never Have I Ever game the other day, I’ve come a long way from disrespecting my money over the years! 95% of that post was inspired by true facts from yours truly, haha..
And if this Joe Schmo can do it, I have no doubt that anyone else can too. Back and ready to rock! Who’s with me? ?